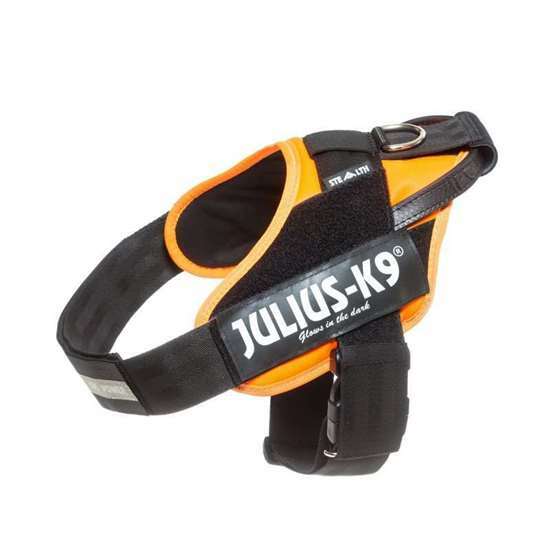 IDC® STEALTH® Powerharness, Size 1 - Orange - Las Vegas K9 Inc.
Julius-K9's brand new IDC® STEALTH® product came out in September 2015 as the dog harness to law enforcement. On the back part of the harness you are able to attache IR beacons. during the movement of the dog, the safety lock covering the buckle allows soundless and noiseless usage. special anti-slip covering of the harness handle ensures the secure hold of the dog. the special coverage of the handle prevents the dog from getting stuck and unauthorized person can not have access to the handle. heightened Velcro straps for on duty badges. the Velcro lable field on the chest strap allows us to attache light reflective elements and parts. The new handle closing option allows free airflow under the harness. By using the neoprene covered handle fixing option, the strap lifts the harness about half a cm above the dog's spine. This way, the air can freely flow under the harness, for increased comfort. Dogs prone to allergies may suffer skin irritation from equipment that directly contact the skin, despite that the materials used by Julius-K9 DO NOT contain irritant ingredients. In case of allergy symptoms it is advised that you remove the equipment from the dog and disinfect the equipment by regularly hand washing and drying it. In case of recurrence of skin irritation try to avoid typically allergen food and ask for veterinary assistance.